OUR 2019 SUMMER CAMP SCHEDULE IS ONLINE!! Ages 7 – 15 – your children will be grouped by age IN each camp! 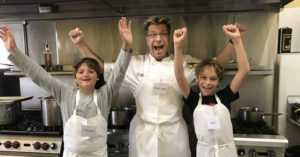 Let Chef Eric teach your budding Chef how to work in the Kitchen! 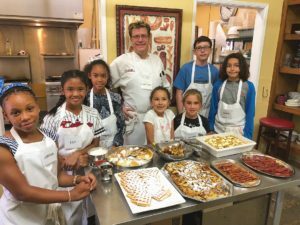 There will be a variety of chef students of all ages in these Classes. 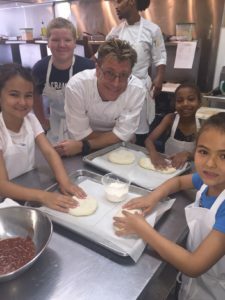 Students will be paired with chef students their own age! 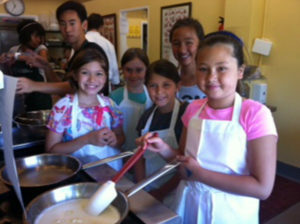 We’ve been called the BEST Cooking Camp in Los Angeles by parents and children for 16 Years! Come see why!! INTERNSHIPS ARE AVAILABLE! Contact us for more information. NOTE: Please feed your children before class as we won’t be eating until the end of class each day. Thank you! PLEASE let us know if your child has ANY ALLERGIES! 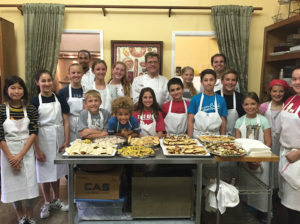 Culinary Academy 3 – A Camp with International flair! 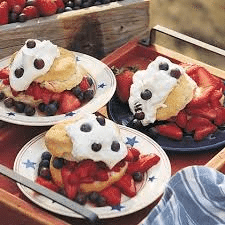 Italian Cuisine, Mexican Buffet, Asian Cuisine, American BBQ – all with Desserts! 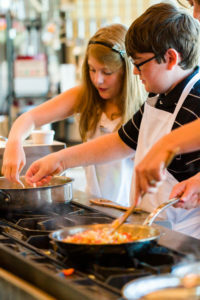 Our cool classes can improve far more than your kid’s culinary prowess. Here’s how! Math – Adjusting measurements, doubling recipes, and working with fractions are all integral to basic baking and cooking – and your kid won’t even realize they’re practicing math (which, let’s face it, is the best way to practice math). Science – Especially through baking, your child will learn how different ingredients interact to create different results. If the timing or combination is off, the cupcakes will be too! Cooking is pretty much one big science experiment, but tastier. 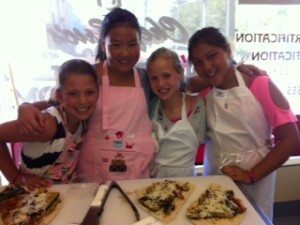 Comprehension – Reading a recipe, understanding techniques like blending and folding, and following ordered step-by-step instructions are all important aspects of creating a proper final product. Throughout this process, kids improve their reading skills and strengthen their memories! Communication – Life is all about playing well with others. 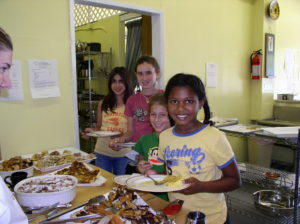 Our camp provides prime opportunities for healthy socialization – whether kids are listening to instructions or borrowing extra flour from a new friend, they’re learning to productively connect and converse with fellow human beings. Fine Motor Skills – Developing fine motor skills is a vital part of growing up, and a natural benefit of cooking at a young age. Kids will quickly sharpen their coordination through basic movements like mixing and measuring. …And you just might get some home-cooked meals out of the deal, too! children to our kitchen with safety procedures. 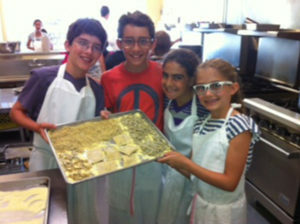 Your children will return home with new skills and want to help in preparation of family meals. Day #4 – Breakfast Buffet– Easy Cheesy Omelet – each child makes their own omelet, Oven-Baked Crispy Turkey and Pork Bacon, Challah Bread French Toast with Vanilla Bean and Maple Syrup, Snowy Pancakes with Powdered Sugar, Deep Dish French Toast with Cream Cheese and Raisins, Waffles, Chocolate Chip French Toast with Homemade Strawberry Sauce, Baked Breakfast Potatoes with Onion…YUM! Day #4 – Meals with Desserts – Teriyaki Beef and Vegetables With Noodles, Grilled Halibut with Bacon and Red Onion Relish, Barbequed Chicken and Apple Kebabs, Vegetable Burritos with Brown Rice, Grilled Corn on the Cob with Herb Butter, Mini Apple Pies and Strawberry/Blueberry Shortcakes with Whipped Cream. For kids who love being in the kitchen and parents who love to eat their creations! Full International meals, adding baking of desserts encompass this series. 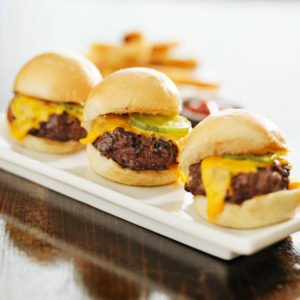 Day #4 – All American BBQ and Desserts – ‘James Beard-Style’ Hamburger Sliders, Grilled Chicken with Homemade Deep South BBQ Sauce, Oven-Baked French Fries, Homemade Tomato Ketchup, Traditional Potato Salad, Magnolia Bakery Vanilla Cupcakes with Vanilla Buttercream Frosting. 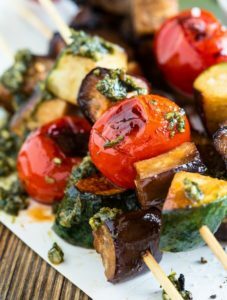 We’ve added delicious dishes, fantastic grilling recipes, and International Cuisine exploration, as well as incorporating Baking and Desserts. Watch your kids create menus for you and your family at home with these great recipes. Day #4 – Hearty Grilling and Desserts– Oven-Roasted Vegetable-Stuffed Flank Steak, Grilled Shrimp with Asian Dipping Sauce, Traditional Steamed Rice, Grilled Strip Loin Steak with Kalamata Olive Tapenade, Honey-Mustard Baby Carrots, Roasted Vegetable Kabobs with Greek-Style Marinade, Warm Chocolate Cake with Homemade Berry Sauce. 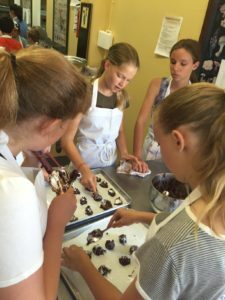 We have a Camp for Baking and Pastry Camp! Come join in the fun and enjoy delicious desserts and baked goods loved by us all. Day #4 – Cinnamon Sticky Buns with Raisins and Caramel Glaze, Sweet Irish Soda Bread, Traditional Scones with Homemade Orange Butter, Cornbread Biscuits with Cheddar Cheese. I want more information about Kids Summer Classes!